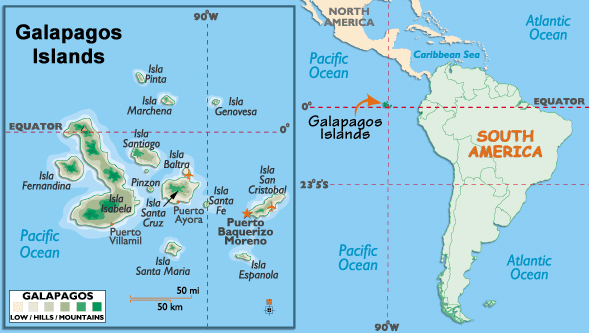 The Galapagos archipelago, located 563 miles from Ecuador, consists of 13 large islands, 6 small and more than 40 islets of volcanic origin. There are 13 major islands, -4 of them inhabited: San Cristobal, Santa Cruz, Isabela and Floreana. This extraordinary natural laboratory is a fusion of rare species of fauna and flora of unique natural values in the world. Unesco declared the Galapagos a Natural Heritage of Humanity and later was designated Biosphere Reserve. Scientific studies of Charles Darwin and Teodoro Wolf gave more fame to the region. 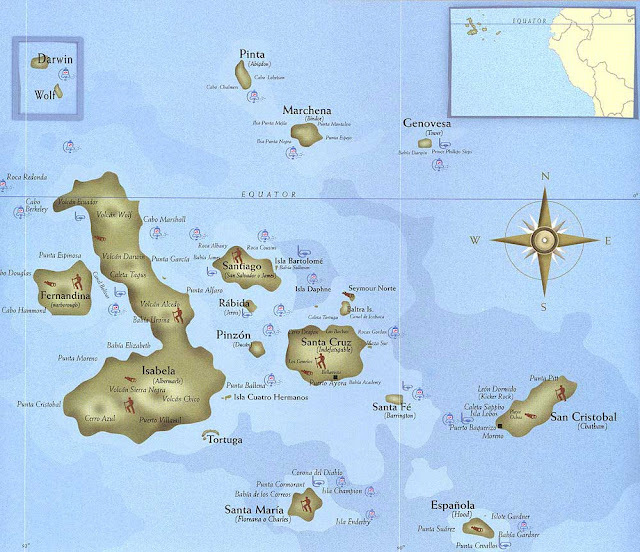 Galapagos Island map is very useful if you are planning to go on vacation to the Galapagos Islands, either to take a tour, enjoy a cruise, travel, meet its exotic flora and fauna, or simply make an adventure trip.